The men's Dubai Duty Free Championships get underway on Monday, and the the tournament, a favourite for many of the players on tour, features 8 of the top 10 ranked players. They are Novak Djokovic (1), Roger Federer (3), Andy Murray (4), Jo-Wilfried Tsonga (6), Tomas Berdych (7), Mardy Fish (8), Janko Tipsarevic (9), and Juan Martin del Potro (10). The seven seeded players behind Novak Djokovic will all be attempting to dethrone the Serb, who has won the title in the past three years. 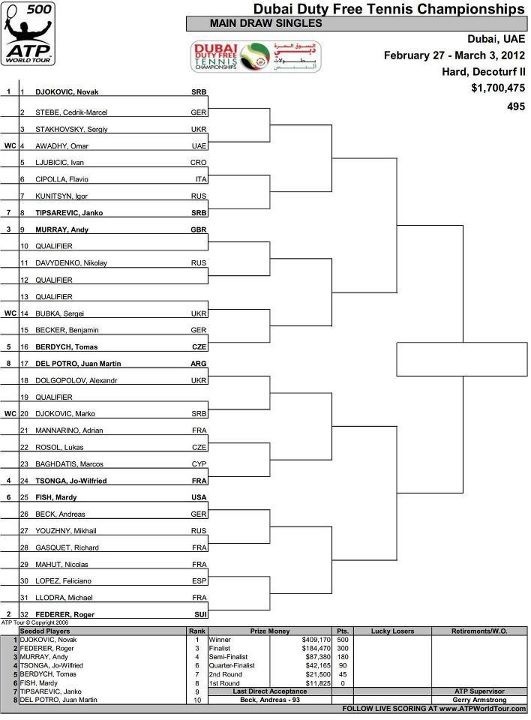 The draw is as follows: The four qualifiers are Swiss Marco Chiudinelli, Andrey Golubev, Luka Lacko, and Michael Berrer. Second seed Roger Federer has a tricky first match against Michael Llodra. Llodra just came off a final effort in Marseille, losing to Juan Martin del Potro, and is looking in very good form. Expect Federer to get by that match routinely, but it won't be easy. After that, Fed will play either Feliciano Lopez or Nicolas Mahut in the 2nd round. Should Roger get by that match, he will most likely meet Mardy Fish in the quarters, although Richard Gasquet and Mikhail Youzhny lurk in there as well as potential upset opponents of Fish. Del Potro and Jo-Wilfried Tsonga are his potential semifinal opponents. Tsonga has a tough opener against Marcos Baghdatis, so he'll have to be sharp to get by as the Cypriot is always dangerous. It is worthy to note that del Potro's second round opponent could be Djokovic's brother, Marko. However, he will have a tough first round match of his own against the always unpredictable Alexandr Dolgopolov. Speaking of Novak Djokovic, he has a good start, playing German Cedrik-Marcel Stebe in the first round. His second round opponent will either be Sergiy Stakhovsky or wildcard Omar Awadhy (most likely Stakhovsky). In the quarters his most likely opponent is 7th seed and countryman Janko Tipsarevic, although don't write off veteran Ivan Ljubicic either. In the semifinals he will for all intents and purposes play either Andy Murray or Tomas Berdych, who have a great chance of meeting in the quarterfinal. Before that, Murray may need to get past Nikolay Davydenko, who had a great week in Rotterdam in pushing Federer to the limit in the semis before falling. Of the two halves, I would say that Federer has the better side than Djokovic. Llodra should be a tough opening round match but after that, Roger has great comfort playing Lopez, Mahut, Gasquet, Youzhny, Fish, Tsonga, and Delpo. No matter what happens in the draw, Roger has favourable matchups, and he should be fairly confident after his triumph in Rotterdam. Djokovic will have a very comfortable path to the quarters but if he meets Tipsarevic there, he could be in for a fight. Janko beat Novak at the World Tour Finals last year and if Novak is feeling any ill effects from not playing since that epic Australian Open final against Nadal, he could be upset. I doubt it will happen but it is food for thought. Speaking as a Federer fan, I would not be disappointed if he does not win this tournament, but I believe it would be a great boost of confidence to lift the trophy at the end of the week. Heading into Indian Wells and Miami, two 1000 tournaments that he has not made the finals of since 2006, he will need all the momentum he can get. As I said previously, the draw is good for him, and there is not a single player in his half that he does not have confidence against. Perhaps his potential result in the final could decide on who meets him there, whether it's Djokovic or Murray or someone else. I believe he would have a better chance to beat Murray, but if he plays Djokovic, I also believe he can beat him if he brings his A-game, especially if Novak is not at his best after the long layoff. Anyways, I'm hoping for a fantastic week of tennis ahead. Dubai is a great tournament and the players love playing there, so let's hope we get a week full of drama and excitement, and a great final in the end. (Here's looking at you Roger, in that pitiful final last year). Heh heh, just kidding.